Complement your wondrous ensemble for the upcoming wedding gala with these gorgeous traditional gold colored Jhumka. While the beautiful design gives these jhumka their eye-catching charm. This item in Designer Earrings & Jhumkas category was first added to our catalog on 09-02-2017. 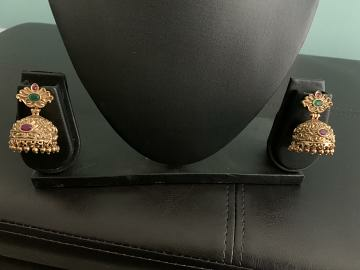 Buy ANTIQUE GOLD PLATED JHUMKA EARRINGS, sold & shipped by Elegant Attire where you can shop online for Bespoke Designer Indian Fashion Clothing for Girls and Women. This Earrings collection has been tagged as ANTIQUE, GOLD, PLATED, JHUMKA, EARRINGS.